Ah, Friday...such a happy, longed-for day! Some people celebrate Friday's arrival by going out for dinner. Others might bar-hop, catch a movie, play Scrabble with the kids. This was no ordinary chicken show. Friday's chicken show launched the career of Kiki, a.k.a. Chicken Mama--and her baby, Sugar. 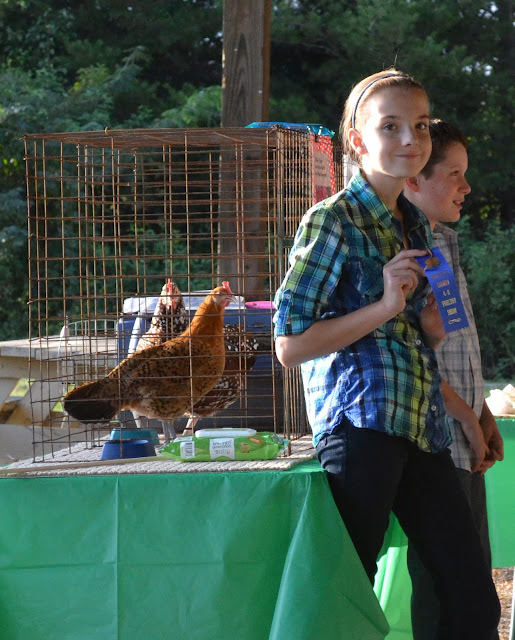 The chicken showmanship event, part of the Greenville County 4-H program in which Kiki participated, caused major excitement at our house. Rehearsals, studying, and primping--all to ready the girls--feathered and not--for the show. Did I ever think we'd participate in 4-H? Ummm...no. Honestly, I always thought only farm kids participated in 4-H.
She tried to ride the mat like a horse. We tried piano...but found practicing painful. We signed-up for gymnastics...she didn't give a flip. 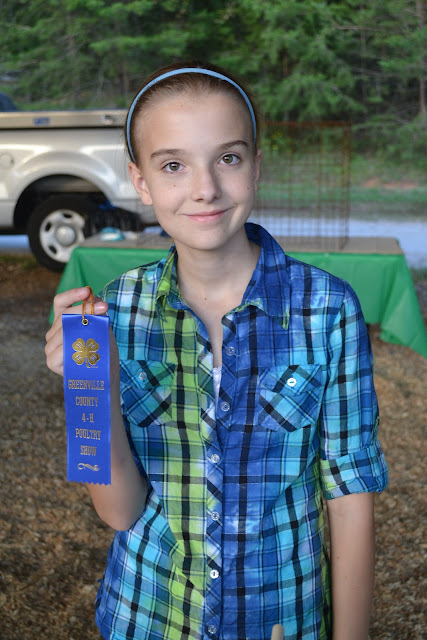 So, when my friend, Cyd Brown, mentioned the 4-H Poultry Project, I knew our girl would love it. 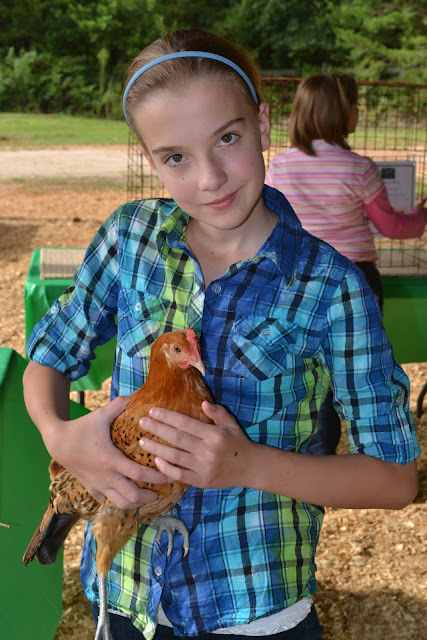 Not only do the students raise and care for the chicks, they also must keep records of how they care for their flock. Then, as part of the program, they learn the anatomy of the birds, as well as the specific habits of their breeds. Finally, the students learn how to "show" a selected bird. 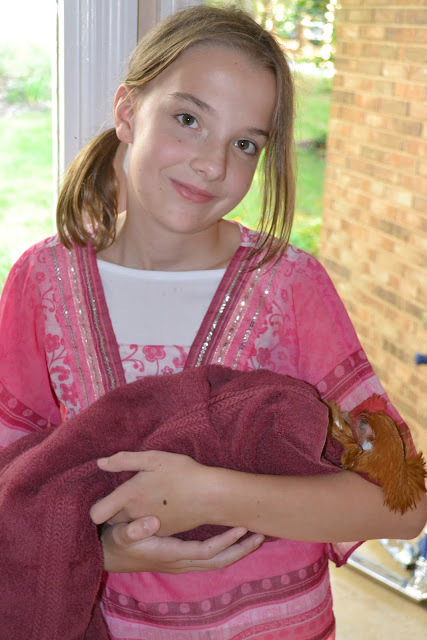 Did you know that chickens need baths if they will be shown? Sugar post-bath. She fell asleep in Chicken Mama's arms. Who knew showing a chicken could be so complicated? 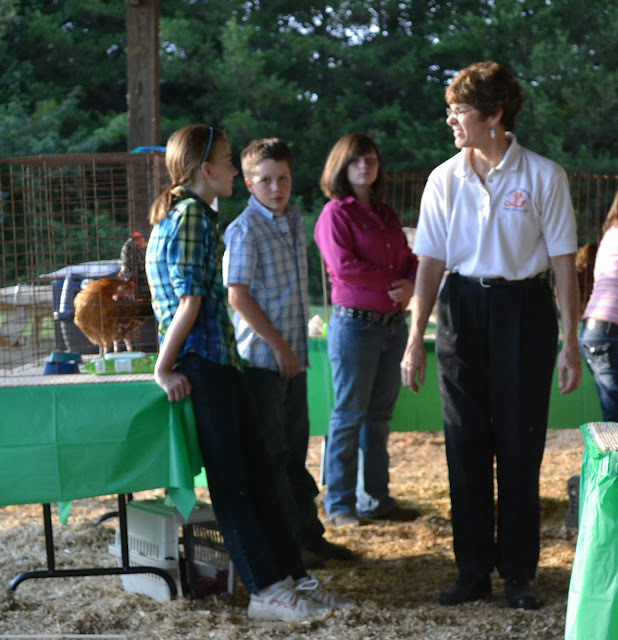 Shortly after we arrived at the show, Dr. Mickey Hall, a professor at Clemson University and an amazing expert on poultry, arrived with several of her students. The first step of the show--blood testing the chickens to ensure they were disease free--caused the most stress for Kiki. 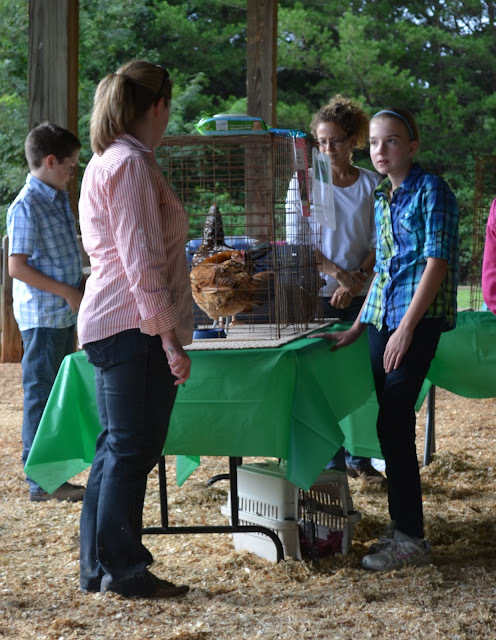 Dr. Hall appointed one of her students--who also shows poultry--as the judge for the event. 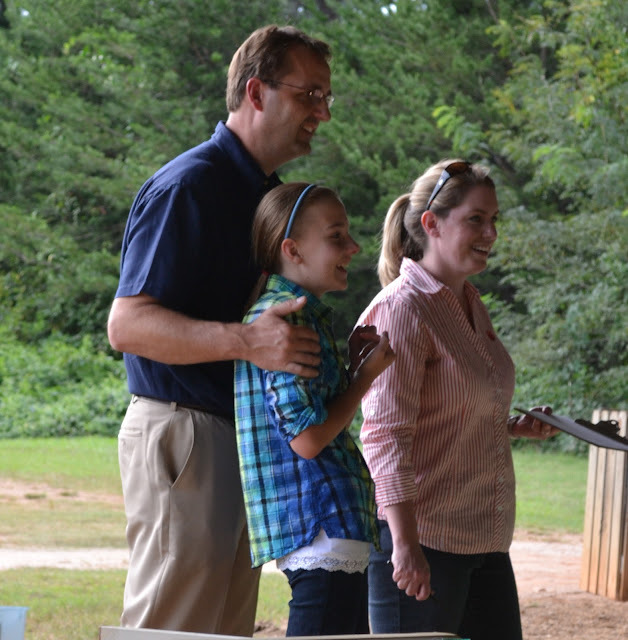 A few weeks prior to the show, Dr. Hall presented a showmanship workshop for the kids, organized by Cyd. She definitely knows her chickens! During the first stage of the show, the students present their birds and perform an examination of the bird for the judge. ...the undercolor of the feathers, the feet, the head and the vent. What's the vent, you ask? Well, it's the multipurpose opening in the hen's rear--and by multipurpose, I do mean multi-purpose...egg laying, breeding...and, yes, pooping. After the examination of the students' birds, it's show time! ...while Kiki shows Sugar when to turn. Honestly, I held my breath while Sugar walked. She's a flighty bird. I feared we'd be chasing her around the shelter. Whew. Kristen thinks this guy has a crush on Sugar. He's handsome! After all of the students finish showing their birds, the judge asks the student questions about his or her chicken and its breed. 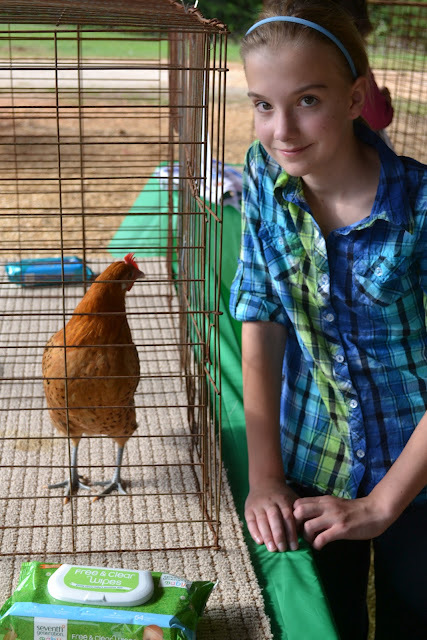 The kids need to demonstrate that they've learned what to feed the chicken, how to care for it, what color eggs it will lay (if a hen or pullet), and where the breed originated. After all of the questions were answered, Sugar decided to cause a scene. When the chickens are blood tested, they receive a numbered tag pinned to their wing as proof of the blood test. Somehow, Sugar managed to remove the small metal tag--and Kiki panicked, fearing she might swallow it. Dr. Hall to the rescue! She reassured Kiki that Sugar's "bling" wouldn't bother her anymore. So proud of our girls! Honestly, even though I never expected to become a 4-H mama, it's a wonderful program and terrific experience for animal-crazy kids. Cyd Brown, the Clemson Extension Agent in charge of the Greenville 4-H program, is fantastic--she's a terrific source of information. Of course, now Kristen thinks we need a goat. or she's going back to ballet!